Get notified with real-time Desktop Notification whenever viewer opens your document. You can track the precise location from where the prospect has opened your document. Set expiration date of the link so that recipient will be unable to see documents after a certain time. Get the insights about how many times a prospect has opened the document. Know exactly how much time the prospect spends on your document. Send your documents and document links directly from Gmail or Outlook. Ask for the visitor information and know who is opening your document. Restrict unauthorized users from accessing your documents. Know which Document is performing the best and organize and set access preferences. Create folders and share it with specific teams to organize documents effectively. Get a notification if your recipient didn’t open your document until a certain set time. Find out the time a recipient spends on each page as well as the percentage of Document viewed. Create a single link that consists of a set of multiple documents and get detailed analytics. With SalesHandy’s Document Tracking, you can track your Documents, Presentations, Sales Proposals, Pitch Decks, Marketing Material and Sales Collateral after you hit the ‘Send’ button. Understand your prospects behavior and engagement regarding your documents and thereby align your Sales Strategy. 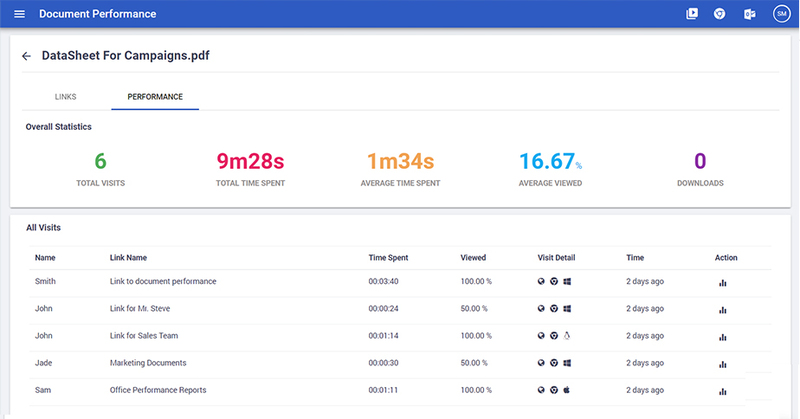 SalesHandy Document tracking Software makes documents sharing more effective for sales team by enabling them to send, track, control & track engagement with document analytics.